The topographical and functional architecture of the human brain is highly complex. This stereoscopic atlas provides new insight into the human brain. The illustrations in this stereoscopic atlas have been developed using a new 3D-visualization computer model. In combination with the CD-ROM, which contains all 173 illustrations as rotatable 3D models, this innovative atlas provides a new conception of spatial structures. 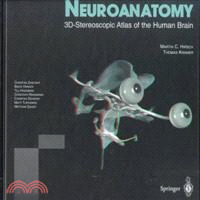 It has never been so easy to understand the architecture of the human brain!